“It is remarkable that the technology available to the police, particularly in their interaction with other parts of the criminal justice system, is as rudimentary and as primitive as it is. It haemorrhages efficiency. * lack of police numbers. It’s okay to say that budgets are cut and that the public should get more bang for their buck, however, if we do not have the resources in the first place how are we meant to be ‘preventative’. I will often task officers in the their ‘downtime’ to patrol certain areas where we are getting hit for crime, however, ‘downtime’ is the issue. When you are working on minimum staffing levels and jobs are coming out thick and fast, officers dealing with jobs that we should never have been sent to in the first place, it makes it very difficult to add ‘crime prevention’ to the list. * Repeat offenders not getting the appropriate sentencing – how often do officers put in hard work and effort to get an investigation to court only to find that the offender being given a lenient sentence? Having the full support of the courts would be useful. It should be victims and witnesses who have the full support of the courts. * More agencies needed, working towards dealing with alcoholism, drugs and other addictions, or dealing with young people. Police seem to be sweeping up all the areas that could be prevented by others, but aren’t and therefore we end up dealing with the aftermath, as usual. 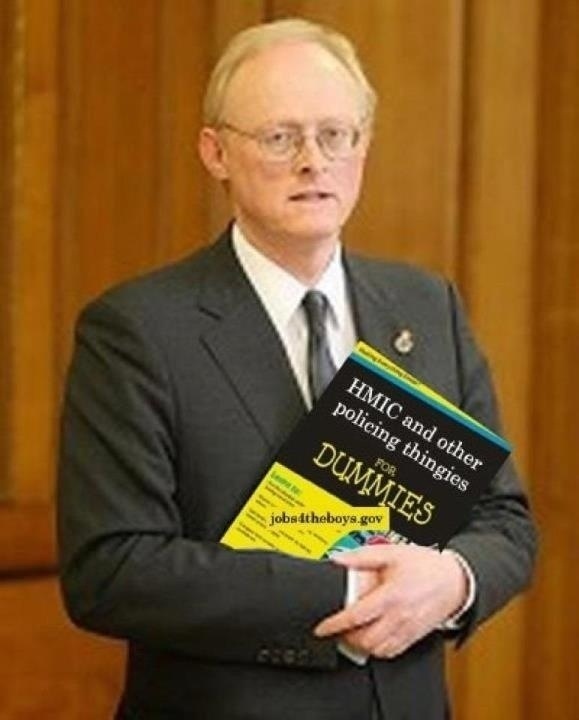 Mr Winsor insisted crime prevention was “not the sole obligation of the police, It is the obligation of every citizen and that includes the other agencies and emanations of communities and the state. Parents and families, as well as schools and other educational institutions, must instil in children a strong appreciation of right and wrong….Prevention is also an obligation of health professionals, particularly in the field of mental health where undiagnosed or untreated illness can, as we know, lead to the commission of serious violent crime.” Mr Winsor said the biggest greatest frustration cited by officers was dealing with individuals with mental health problems. Then lets concentrate on others apart from the Police to deal with issues that contribute towards people committing offences in the first place. How many times do we put in reports for mental health, children services, alcohol and drug services and feel like we are banging our heads against a brick wall? * Citizens taking responsibility for their actions and to deal with issues which shouldn’t involve the Police – a **** filter in the control room – trying to report something which clearly isn’t a police matter or so trivial that the average ‘intelligent’ person would be able to deal? No attendance. Simple. More lessons in parenting skills supported by giving teachers more ‘powers’ to deal with wayward children. Mr Winsor has also had the ‘fab’ idea of having the new ‘Tardis’ or ‘Cops in Shops’ – wow! what a novel idea – it must have taken a lot to take out that idea and blow the dust off that file circa 1950. So instead of having Police Stations where members of the public can come, we have people in shops, using their facilities rather than our own, have people doing their weekly shop, milk, butter, eggs, bread and make a complaint to the police. At least that would save some cash I guess. ‘ The police were relied on as the service that “will never say no”, he added, but other bodies must do more.’ Were? We still are, and always will be the Police who ARE relied on that ‘will never say no’ until changes are made. Really?! No **** Sherlock – perhaps he should have been a Police Officer. Now we need less ‘talk’ and more ‘do’. Now we can rest safely in our beds. ← The right to remain silent………. Until the day when skynet goes live and our robot overlords take over technology will always play a minor role in policing. I have yet to see the day that a cctv camera or a camera on a blackberry managed to prevent,stop,intervene, chase,fight,arrest,process ,interview and prosecute a criminal. it helps but it isn’t a panacea. it still takes bums on seats. I now see our own leadership playing the crime is down,because arrests are falling game,having compared last year and the year before. Failing to grasp statistical analysis or taking into account factors such as the retail riots and the focus on code G. etc etc. Proper crime(yes, I would rather be out catching rapists and muderers) may be falling, however the tut that we now deal with is ever increasing – as no SMT has the balls to say this is crap ,it’s crap that is societies problem and not a policing issue, or sort your own sh*t out we aren’t social service/marriage guidance/barnado’s/your GP or the Samaritans. This isn’t to say we won’t turn up and deal/help/advise provide morale guidance- it’s just don’t expect us to solve YOUR petty crap out and don’t complain when we don’t or even do. There used to be two types of people who joi8ned the job, those who cared, wanted to make a difference,wanted something different and were incentivised by the decent pay and conditions…..and then there were the thickasshit power trippers. St duties,probation and reliefs usually weeded out the vast majority of the latter before they took not only themselves down but others with them. Then the sgts passmark was reduced as was what it took to be an inspector and the backbone went, nonone wanted to tackle difficult issues in the cops as it was all about targets and customer focus, so sideways moves,decent appraisals were given and the number of these numpties moved on or up the rank structure,to the detriment of us all. I could go on, but have to go to bed. Yup. You are both right. And Tom Windsor is, it would appear, as clueless as when he started out. This ridiculous idea of Tardis type drop in shops is, as you say, nothing new. We have been doing it for years. Mainly because we are closing more and more police stations so that we can balance the books. One area in my farce now has no discernible police station that Jo Public can go into to report crime, speak to an officer etc. They have Police Interaction Points (or some such) in a shop, council office, library. It’s a frikkin joke. All because we can’t afford to keep stations open. The thing is, we are selling property at a time of a depressed market (didn’t Brown do the same with our gold reserves) and once we have that saving what have we got to sell when the next round of cuts are due?